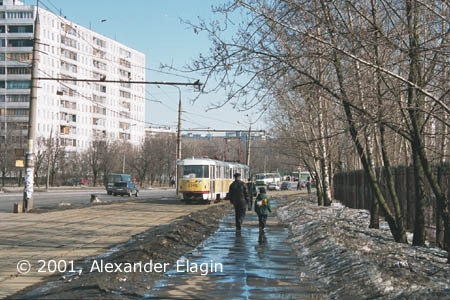 Medvedkovo is one of many new districts that raised in Moscow in 1960's. The common problem for such districts was poor connection with the city centre. The problem was solved here by construction of a tramline, and regular operation of it was begun on September 11, 1966. 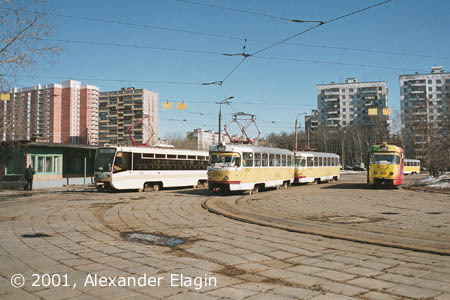 Tram remains the basic public transport of this district, and the Metro line that came here in 1977 did not affect the tram's major role. 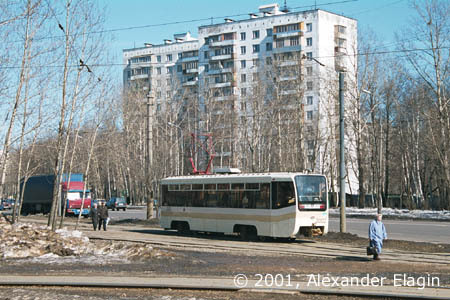 Sukhonskaya Street tram stop. This is the first stop in Medvedkovo. Huge blocks of flats in the background are located just across Yauza river, near Babushkinskaya Metro station. The tramline goes along Proyezd Dezhneva, a wide street with rather heavy traffic (not seen in this photo because of weekend). The two-car tram train goes down to the valley of Yauza river. The route makes a turn from Proyezd Dezhneva to Polyarnaya Street and goes north. This street is a backbone of the whole district and there are many shops, entertainment centres, cinema and other public buildings here. 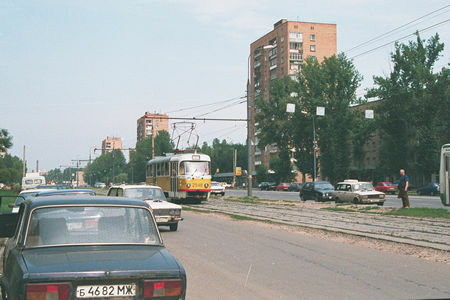 The tramline along Polyarnaya Street ends here. 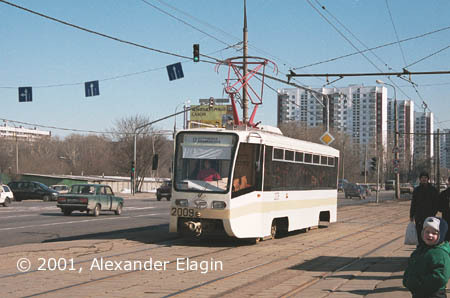 This tramcar enters the Medvedkovo terminus. Note the typical buildings of early 1970's in the distance. The "northern edge" of the Moscow tram system is here, at Medvedkovo terminus. As you can see, this terminus is rather large and it has three tracks.